Having made a striking directorial debut in 2008 with Tony Manero, Chilean filmmaker Pablo Larraín followed on with the 2010 Post Mortem, which also starred Alfredo Castro and was described by Jonathan Romney in Sight & Sound as "an enigmatic but utterly distinctive and troubling film," and Philip Wilding in Empire as "a sometimes shocking, often moving journey through a blood-stained corner of the past." In February Network are to release Post Mortem on UK DVD, both as a stand-alone disc and as a two-film set with Tony Manero. Santiago, 1973. Mario Cornejo (Alfredo Castro) works at a morgue, typing out reports on autopsies performed by the coroners. On the days leading up to the military coup resulting in Salvador Allende's death, he gets involved in a love affair with Nancy (Antonia Zegers), a dancer from the cabaret Bim Bam Bum. The story of this apparently charmless and insignificant couple is Chile's story during the infamous military coup. Larrain uses Mario's ideal of conquering the impossible love of a woman as the ideal of a nation trying to conquer a noble but unattainable political model (socialism). All this amid the bodies of those who died as a result of military ideals imposed with no care for their cost or consequences. 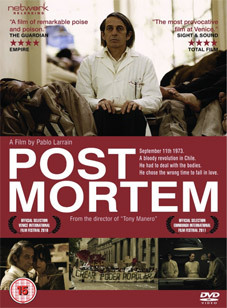 Post Mortem and Made in Chile: Two Films by Pablo Larrain (containing both Post Mortem and Tony Manero) will be released on UK DVD on 23rd January 2012 by Network Releasing at the RRP of £14.99 and £19.99 respectively.